When choosing the best scooter for kids or toddlers, there are a few important things to remember. First, pay attention to the recommended age, as there is a scooter that is best for each child’s age. Second, there are certain elements that each scooter has that will differ, and determine the experience for your child. Below, we outline these elements, as well as the top ten scooters, for each respective age group. 2 When Your Kid Ready for a Scooter? As scooters have gathered momentum in popularity over the years, definite advantages and disadvantages have arisen. Increases gastrointestinal motility – the exercise enhances the child’s gastrointestinal digestion, while also increasing their appetite, nutrient absorption, and metabolism. Improves blood circulation – thus increasing and improving the growth of developing cells and organs. 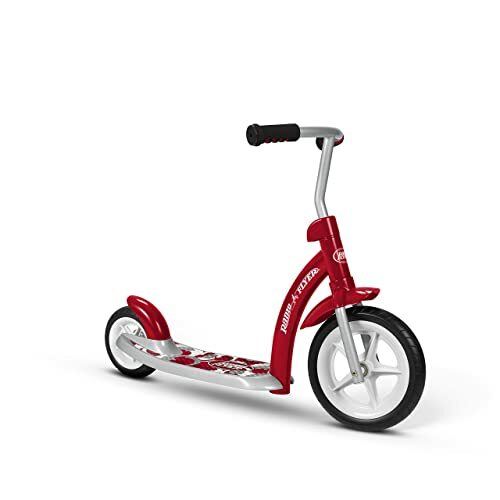 Increases muscle power and strength – as riding and propelling a scooter exercises the child’s limbs and torso, it strengthens the correlating muscles, including the developing abdominals, back muscles, upper and lower legs, and arms. Fresh air helps to prevent serious disease – and outside play also promotes healthy, intelligent brain function. Improves balance and coordination while developing the nervous system. Safety – many children take a tumble or two when learning how to ride a scooter. Type – sometimes finding the right scooter for your child can be difficult. Roads – there can be debris in the streets that can get caught under scooter tires, causing accidents. When Your Kid Ready for a Scooter? As mentioned above, scooters are an excellent and exciting way of motivating a child to get outside and play. They will develop their balance and coordination, while exercising and, potentially, socializing with other scooter-riding kids. From the age of three onward, scooters provide children with a versatile way of transporting themselves around the neighborhood. Plus, if at first a child is uncomfortable with two wheels, there are extra-wheeled options, just like on a bicycle! Each scooter will have an age range that it is predominantly best for, but you should still consider the weight and height capacity of the scooter as more important than the proposed age bracket. However, as soon as your child wants to start to pedal or push, there will be a trike, scooter or tricycle ready for them! First, choose between two or three wheels for your child’s scooter. The learning curve will be less intense if you choose to start your child with three wheels. Just as with bicycles, three wheels helps children find their balance, before they move to two wheels. Your child will be less likely to have any accidents with three wheels. Generally, parents switch their children from three to two wheels at around five or six years of age. 1. Assess the Weight and Height Capacity of the Scooter – Sometimes, the scooters for toddlers will have very low weight limits, so double check to be sure it will support your child. As for height, the handlebars can be easily outgrown, so it is best to purchase a scooter with adjustable handle bars that will grow with your child. 2. Wheel Size is of Importance – If the diameter of the wheel is larger, the scooter will be more versatile for differing terrain. 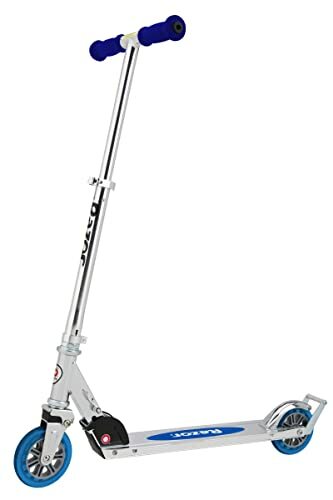 I remember all the times my skinny-wheeled scooter would get stuck on a pebble or crack in the road, frustrating my fun! 3. Stability of a Scooter Will Affect Play Time – The wider the standing platform between the two front wheels is on a three-wheeled scooter, the more stable you can expect the scooter to be. 4. Last, the Braking System on a Scooter will Affect Safety – Much like rollerskates, many scooters house their braking system as a push-down pedal over the back wheel. Some scooters will have no brake system, but it is always best to have one, for safety’s sake! The wide and sturdier the brake, the better, but handlebar grip brakes are by far the best system on the market. 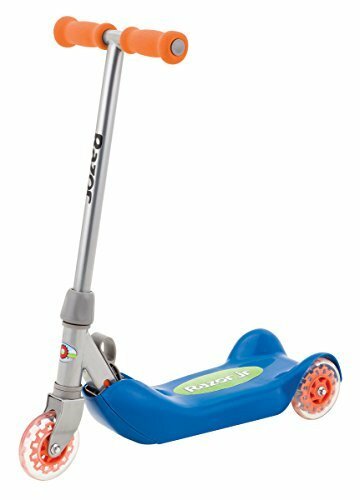 This is the best scooter for four year-olds because of the extra wide foot deck and thick rear foot brake that facilitate a smooth ride. This transitional scooter will be perfect in helping a toddler explore their first upright scooter, especially due to the huge front wheel, wide handlebars, and gripped handles. Some buyers were disappointed by the plastic deck on this scooter, but it does provide steel strut reinforcers to helped encourage stability and durability. This free-style scooter is unlike any other. 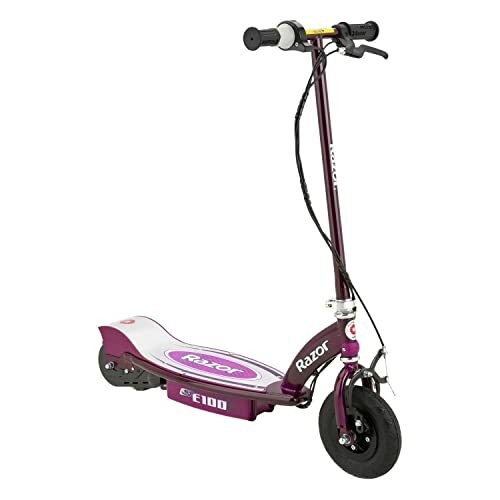 A great challenge for any child, this scooter is most perfect for seven year-olds, who will need to move their hips from side to side in order to get moving. This scooter holds a max weight of 176 lbs, and features a quick-response hand brake for added safety. The three wheels add a sense of stability, but the separation between the two back wheels, creating two separate decks, can cause some instability. This Razor scooter holds up to 143 lbs, and folds up for light and easy carry. It features a rear fender brake, requires no assembly, and weighs only six lbs! 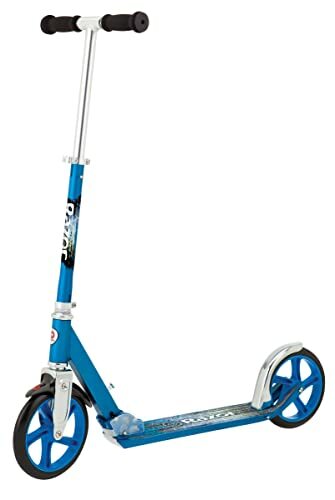 The super skinny plastic wheels on this scooter promote a challenge for any eight-year old rider, especially if they’re interested in starting tricks! The wide, sturdy base on this scooter, along with the three wheels (two in back) provide the perfect stability for an early rider. The scooter houses a child-safe latch for folding, to keep children safe around the scooter at all times! The handlebar height on this scooter is adjustable, and it can hold no more than 45 lbs. 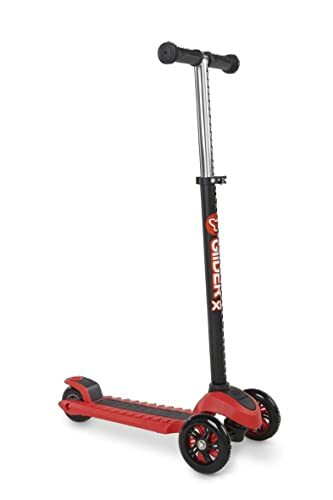 This scooter is great for ten year-olds wanting to try some early experimental riding. The thick foam handles add support and grip, while the large diameter urethane wheels are big enough to make trick experiments safer. The handlebars are adjustable to grow with your child, and the scooter can hold up to 220 lbs. 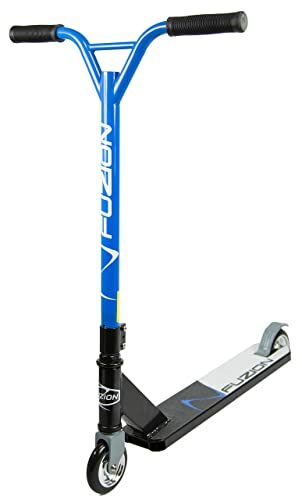 This scooter is great for five year-olds working on their stability! The lean to steer mechanism in this scooter trains young riders well. The scooter features a great, thick grip on the deck for stability support, and for help in preventing accidents. The simple and efficient braking system and rubber grips on this scooter can hold up to 88 lbs. With adjustable handlebars, and two extra wide front wheels, this scooter provides maximum stability. This is the perfect scooter for older riders interested in perfecting tricks, what with its perfected wheelie bar, inline-style wheels, patented rear fender brake, and 125mm diameter wheels, this is by far the best scooter for pre-teens looking to practice more advanced riding tricks. 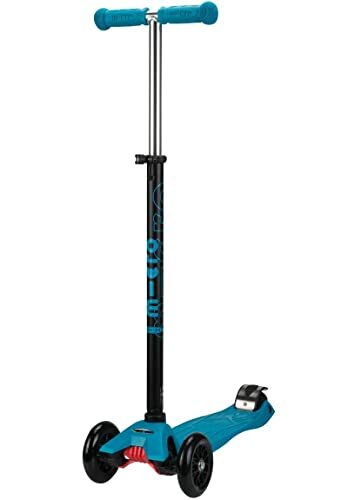 Carrying up to 143 lbs, the scooter folds up neat, only weighs 7 lbs, and has an adjustable handlebar height. This scooter’s Y-shaped handlebars, soft hand grips, and super tiny 100mm PU wheels are perfect for riders looking for a slight challenge. This scooter houses a teeny tiny steel flex brake that is perfect for keeping young riders who are looking to attempt tricks safe. The light, flat-bottomed deck can hold up to 140 lbs. This electric scooter is super powerful, and can move up to 10 mph. There is no pushing necessary with this scooter, and riders can enjoy the long battery life for up to forty minutes before any recharge is necessary. Riders will need to twist the grip to accelerate. Many buyers said that the battery lasted even longer than advertised, and that the large front tire moved swimmingly through street debris. This swiss-designed and engineered scooter allows for a lifetime of fun, as each scooter part is replaceable, and the wheels are made of the highest-quality PU for riding ease. The scooter’s learning to steer mechanism is great for this transitional phase at around six years old. 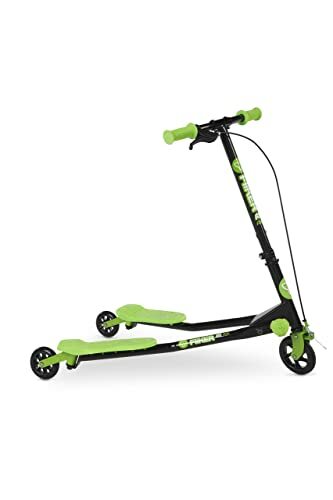 This scooter was made for middle-school kids, and even offers interchangeable handlebars for a malleability of the lifelong experience. Four main types of scooters exist for children, at the moment. These types include beginner kick scooters and kick scooters; caster-driven kick scooters and electric motor scooters. By learning the basic mechanisms of each, you will better determine which is best for your child. Larger tires – allow for a safer ride, as the tires are large enough to smoothly roll over cracks, holes and debris that may be in the child’s way. Wider base – two wheels in back, with one large in front produce easier balance and control for the child. 1. Pay Attention to Age Ratings and Weight Limits – safety increases when you choose your scooter wisely. 2. Pay Attention to Your Child While They Play – supervision plays a major role in determining scooter safety. When you see your child playing dangerously, be sure to speak with them immediately. 3. Helmets, Knee Pads, Elbow Pads, Hand Grips – padding improves safety, tenfold. Especially as your child learns how to ride, these will help prevent road rash or other injury while riding. 4. Choose Shoes Made for Play – closed-toe, thick-soled, grippy shoes with ankle support are best. 5. Teach Children Proper Use – by learning to stop quickly and propel accurately, your child is bound to play more safely. 6. Play in Numbers – it’s always best to encourage children to play outside in groups. So, when you go to pick up your child’s scooter, be sure to pay attention to the details, as scooters differ in subtle ways! 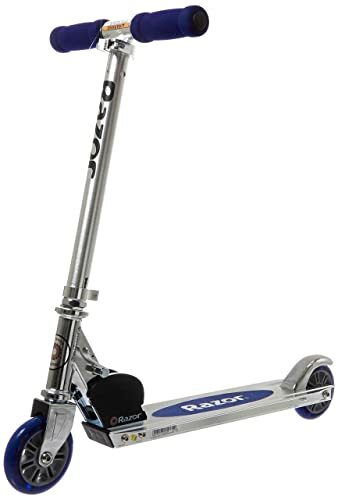 The scooter off this list that I would buy, were I back in my middle school shoes, would definitely be the Micro Maxi Scooter, as it will transitions from toddler to middle schooler easily, with its adjustable handlebars and replaceable parts, and I like to find one thing I love, and love it for a long time. However, the electric scooter is pretty darn tempting, too! All that play; all that speed, without the extra effort! Choose away, and remember to always supply safety gear with the scooter you choose! Best Dog House Reviews 2019 – Which is for Outdoor and Winter? Awesome article! Great variety on models to check up and lots of great tips. I certainly like having my kids playing outside and exercising. Scooters are a great way to achieve that goal. On a side note, I write about scooters too on my website. I wrote some interesting articles. I think that my article about the legality and regulations about scooters is a nice complement to this one from you. If have some time to check it up let me know what you think. I can mention and link your article from mine if you want to “complement” each other posts.